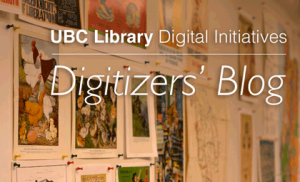 The Digital Initiatives (DI) Unit is a key part of UBC Library’s effort to adapt to the evolving needs of faculty and students, and to support teaching, research and learning at UBC. Its goal is to create sustainable, world-class programs and processes to make the collections and research at UBC available to the world. The Digital Initiatives team is frequently fascinated and excited by the vast amount of primary-source material that it encounters in its digitization work. Whether a document of historic significance, a beautiful illustration or even a particularly fine typeface, DI is often amazed by the materials they’re working to share with audiences at UBC and beyond. Make sure to check out the Digitizers’ Blog to find some of the favourites, hand-picked by DI staff from existing and upcoming collections. We hope you enjoy them as much as we do! 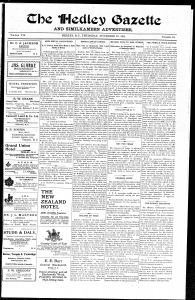 UBC Library’s British Columbia Historical Newspapers Project, which features digitized versions of 24 newspapers from around the province, has received some great media coverage. Articles have appeared in the Globe and Mail, the Nelson Star, Metro Vancouver (see page 28) and Moncton’s Times & Transcript. A mention of the project is featured in this CBC News article. CBC Radio also interviewed Allan Bell, Director of Library Digital Initiatives, for two programs – Radio West and On the Coast. You can find out more about the B.C. 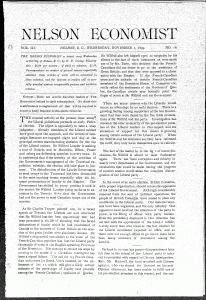 Historical Newspapers Project in the press release. A selection of comments from social media regarding the project are available in Storify. More than 45,000 pages chronicling B.C.’s storied past are available online thanks to the British Columbia Historical Newspapers Project. Read the press release to find out more about this great UBC Library initiative.